An entrepreneur will be pitching her toothbrushing system to the 'dragons' on Dragons’ Den on BBC2 this Sunday. Entrepreneur Sian Ellingworth is a Buckinghamshire mother of two sons who created a toothbrushing system, primarily aimed at younger children who find conventional toothpaste flavours unpleasant. The system includes a fun, safe, easy-to-use, mess-free electric toothbrush with a gentle movement designed specifically as an early stage brush and fluid, mild-tasting toothpastes that sink into the bristles of the brush, delivering the full benefit of the fluoride. They are available in two flavours – Hint of Mint and Apple Fresh. Sian says: 'I launched Buddies to help parents, like me, with children on the autism spectrum who hated the usual oral health routine. 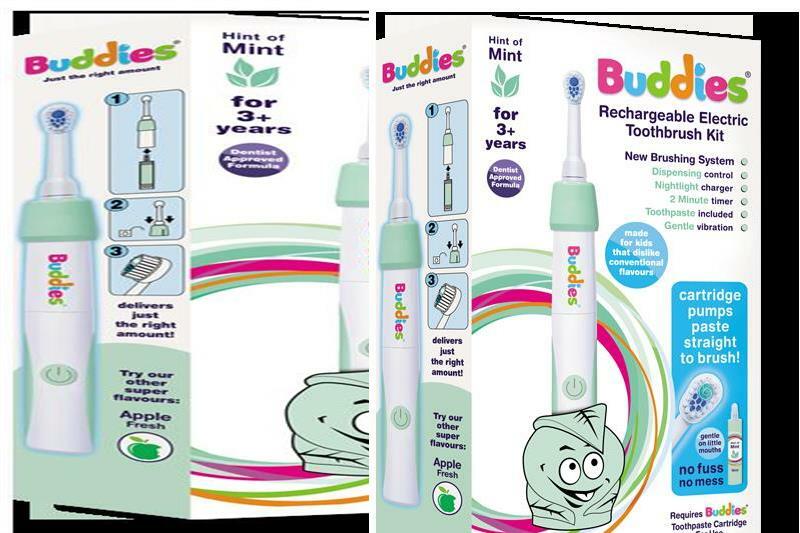 And found that Buddies brushing system is just right for young children too. 'The Oral Health Foundation estimates that 50% of all their helpline calls are from parents struggling to get their kids to brush their teeth. 'Buddies is also perfect for people with dysphasia, elderly people with dementia and others with special needs. Dragons Dragons’ Den is on BBC2 Sunday 27 January at 8.00pm. Formulated especially for children and adults who cannot cope with conventional flavours. Toothpaste launched on Amazon in November 2015. Suitable for those on the autism spectrum and those with special needs. Suitable for those with dysphasia. Suitable for elderly and those with dementia. Interest and demand from care homes, special needs groups and NHS Trusts. Engaging: Character lids make teeth cleaning fun. No Nasties such as Sodium Laurel Sulphate! Recommended: Contains1450ppm fluoride to protect children’s teeth. Two flavours: Hint of Mint – buttery slightly minty flavour. Apple Fresh – a zingy taste for those who don’t like mint. August/September 2019 - On its way: our new secret formula toothpaste! Made in UK by specialists in toothpaste. Patented toothbrush with gentle movement and soft brush. Toothbrush charger incorporates nightlight – engages the child in oral health routine. April/May 2019 – launch of adult toothpaste. Contains no preservatives, sucralose sweetener replaced with natural stevia and a small amount of xylitol, and still the same great taste and texture.